Repetitive strain injuries tend to affect tendons, nerves, joints, and muscles, causing persistent, recurring, and sometimes debilitating pain. There are many different types of repetitive strain injuries. These types of injuries may result from rapid movements, forceful movements, or movements that use fixed positioning with unsupported limbs. Often, forceful grip injuries arise from job activities. At Pulgini & Norton, our Boston workers’ compensation attorneys can help you determine if you have a strong claim and guide you through the process. Any work that forces a worker into an uncomfortable physical position repeatedly or for a long period may result in repetitive stress injuries. Forceful grip injuries are often results of gripping tools forcefully over many hours and days. The injuries may arise from the type of work or the tools used. The grips on the tools may be wide or slippery or require tight squeezing. Similarly, a workstation may not be designed for people of a particular height or strength. After a forceful grip injury, you may suffer from pain, tingling, burning sensations, numbness, loss of finger or thumb dexterity, inflammation and swelling, or nighttime aching. 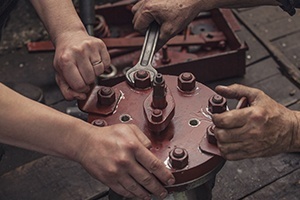 Once you realize that you have experienced a forceful grip injury due to workplace conditions or a particular type of work, you should notify your employer. In Massachusetts, most employers are required to carry workers' compensation insurance for the benefit of their employees. If you are disabled or unable to earn your full wages as a result of a forceful grip injury caused by your job, your employer is required to file a Form 101 with the Department of Industrial Accidents (DIA) as well as its insurer. An employer has seven days to file a Form 101. Sometimes a forceful grip injury claim is denied because the insurer believes that you have a preexisting condition that caused the injury or believes that you were engaged in activities outside work that could result in a forceful grip injury. Often, insurers employ private investigators to conduct surveillance in connection with claims that they believe are suspicious. This may include surveillance of your social media presence. However, in general, a preexisting condition is not a valid reason to deny a workers' compensation claim. Workers may not receive workers' compensation for injuries that were caused by something other than work or before beginning work with their current employers, but if they are injured on the job, and the injury combines with a pre-existing injury, they may still be entitled to receive workers' compensation benefits. The relevant question is whether their work was a major cause of a forceful grip injury. A worker may not realize that a forceful grip injury is a result of activities that they performed as part of a job. It is important to retain an attorney who understands repetitive stress injuries and how to effectively present a case for forceful grip injuries. At Pulgini & Norton, our Boston workers' compensation lawyers may be able to help you with your claim. We also provide legal representation to claimants in Weymouth, Braintree, and Andover, among other Massachusetts cities. Call us at 781-843-2200 or complete our online form for an appointment with a job injury attorney.